Sean Dolan of Hopewell Valley took over the national lead in the mile by running 4:09.84, No. 5 all-time in NJ history, at Saturday's Bruce Lehane Scarlet and White Invitational at Boston University. The Villanova-bound Dolan, who ran unattached, finished fifth in his heat and 17th overall in the open race, which featured lots of former NJ high school stars. Dolan, who won the mile at the New Balance National Championships last June, was just off his outdoor PR of 4:08.86 that he ran last May at the adidas Boost Boston Games. 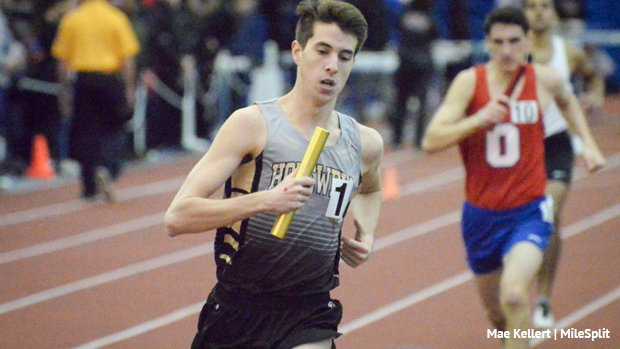 Dolan ran in the same heat as UPenn's Colin Daly (River Dell High School), who was seventh overall in 4:03.65, UPenn's Ray Sellaro (North Hunterdon High), who ran 4:10.44, and Monmouth's Ryan Rafferty (Jackson Memorial), who ran 4:11.62. Rob Napolitano, who starred at RBC and Columbia University, was second in the race in 3:59.90. Jeremy Hernandez, a graduate of Clifton High and Ramapo, was fourth in 4:00.91, and Ben Malone, a graduate of Pascack Valley and Villanova, was fifth in 4:01.72. Dolan's 4:09.84 makes him just the fourth boy in NJ history to crack 4:10 indoors in the mile. Only Edward Cheserek of St. Benedict's Prep (4:02.21 in 2012), Vince Cartier of Scotch Plains (4:06.6 in 1972), Kevin Byrne of Paramus Catholic (4:08.0 in 1977), and Craig Forys of Colts Neck (4:09.77) have run faster indoors in New Jersey high school history than Dolan. Dolan will be one of the favorites when he toes the line to run the High School Mile at the Millrose Games on Feb. 9 at the NY Armory.